The first core value, to "love God with passion", is the one on which our whole life is being built. Without it we cannot even the 2 other qualities of seeking the Truth and welcoming painful changes with faith. Practically it implies daily hours of prayer and meditation of the Word, regular fasting, personal retreats, and basically all the creative and original ways by which we seek God in order to have a strong, intimate and emotional connection with God. The second core value, "seek the whole truth" involves the very idea that we must develop the intellectual and spiritual discipline of constantly seeking the whole Truth as it is revealed in the Scriptures. This implies that we should constantly ask ourselves questions and hear both sides of any truth. The finality of such a quest is to know God, this world in which we live and know ourselves in such a way that we will have practical answers for every single area of our existence, whether this affects moral, social, political, physical or any kind of "-al" that life has to offer. This, in turn, should have very practical implications on how we view the doctrinal unity of the Church and how holistic our religion will become. 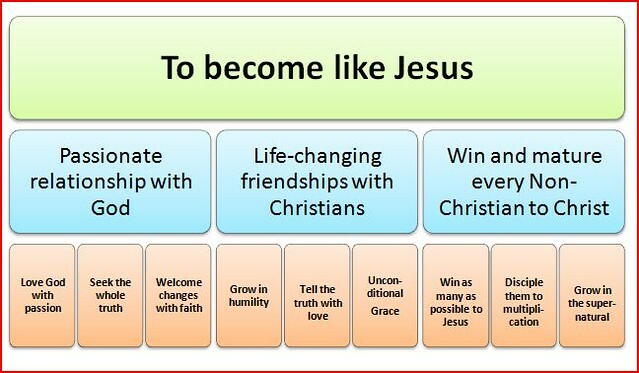 Finally, the third core value, to "welcome painful changes with faith" is basically having the attitude of welcoming all sufferings in life as opportunities to change and mature in Christ. It means that we accept difficult challenges not with a passive and pessimistic resignation, but with the faith that we shall have great victories because all things are possible through Christ. This attitude helps us to avoid both extremes: one is the rosy-easy going-bless me type of Christianity in which we expect God to be a vending machine of all our self-centered needs. The other is the fatalistic depressive religion that sees every suffering in life as a heavy cross to bear. The fourth core value, "humility", is more than the ability to learn from others and welcome corrections and even criticism from anyone, but it is as well the attitude of being vulnerable and transparent about our weaknesses and sins with a few chosen friends. If we refuse to acquire an objective picture of ourselves through others, we will end up giving wrong impressions to them, and will deceive ourselves. We must have the humility to listen and learn from others so that we will have a more objective picture of our characters. The ultimate goal of every Christian relationship is not just feel good or encouraged. This is obviously necessary, but it is not an end in itself. God has given us his Church so that we would grow in the likeness of his son, which translated in our terms means that we should radically change our lives and characters. 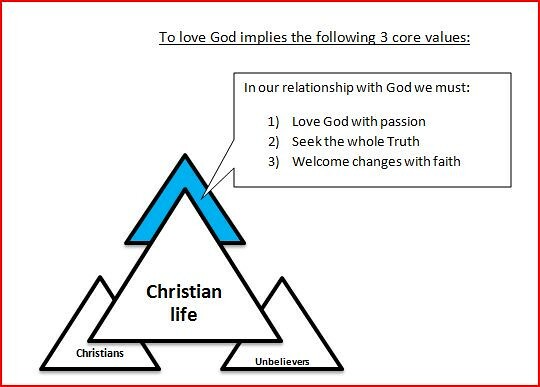 This is where I see the following three relational values as being absolutely essential in helping us reaching this goal. The fifth core value, "telling the truth", is being able to gently but uncompromisingly confront other Christians with the truth of their own sins, in an attitude of patient love. Wisdom requires that we may not always speak our minds to anyone, but this attitude is absolutely essential with the few friends we have chosen to have. In fact, the absence of such a practice is symptomatic of unhealthy and useless friendships. We must have friendships where we tell the whole truth. Finally, the sixth core value, "unconditional grace" means to unconditionally accept and love people as they are, with the same grace and faithfulness that God has shown us in Christ. It basically implies that even if we do not accept their sins, we genuinely accept them as persons, regardless whether they will ever change or not. The mixture of those three components will not only help us to have a powerful transformation of both our lives and our communities, but it will prevent us from being in spiritual danger. For instance, out of the five churches in the book of Revelations that had problems, such that Jesus had to correct them, one, Ephesus, had lost the first core value, her passion for God. Two of them, Thyatira and Pergamum, refused to practice the fifth core value, that is to confront sins in their midst. Finally, the last two, Laodicea and Sardis, did not cherish humility, the fourth core value, as they gave false impressions of themselves. The ultimate goal in our relationship with this world is not just to be compassionate and serving, but to powerfully convert and mature as many as possible to Jesus. The seventh core value, to "win as many as possible", challenges us to all develop a life style where all our priorities in life are to lead as many people as possible to the Saviour. We must train ourselves to develop an attitude in life where absolutely everything is decided and influenced by the priority of winning as many as possible for Jesus. Finally, the ninth core value, "grow in the supernatural" encourages us to develop an evangelism where we constantly minister with the supernatural power of the Holy Spirit. Often whenever Christians want to experience the supernatural it is very self-centered and has very little to do with bold evangelism, which is why they hardy ever see anything happen. The Holy Spirit was given NOT so we seek experiences to please ourselves, but to have power so that we can better face oppositions and win others to Christ. The above is the kind of simple, radical and uncompromising Christianity I advocate for my next church planting. Unlike so many Christians, I do not define my religion by doctrinal differences, but mostly by a deep relationship with God and others that lead to conversions and radical character changes. My religion is one that is driven by a holy passion of chasing after God and his Word, and yet disciplined enough to bring other books and the cross with it; it is a religion that is never afraid to confront its own members to radically change their characters at any price, and yet gracious enough to never ever give up on them; a religion that is bold to evangelize in the power of the Spirit, and yet wise enough to keep and even multiply every single convert through discipleship. It is a religion that follows a simple plan, the Master plan. It has not changed in its essence ever since it was exemplified by our Lord. What is your own plan and main priorities? 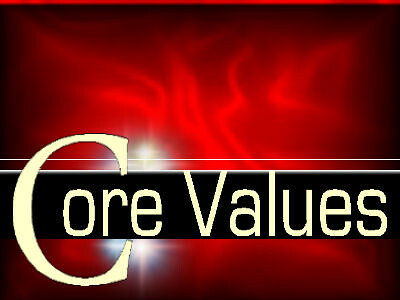 How do you therefore define the core values that characterise both your life and your church?